I began by cutting the base of the fish bowl using Whisper White cardstock and the 5th circle in the Circle Framelits die. I then repeated the process using Baja Breeze cardstock (I'm trying to use up a few of my discontinued papers but Marina Mist would have worked well too). After cutting all the necessary circles I positioned the scalloped edgelit from the Adorning Accents set approximately 1/3 of the way down each of the Baja Breeze circles and ran that through the Big Shot. To give each bowl of water a little depth, I sponged the edges with Midnight Muse before adhering it to the white circles with Multi purpose glue. To finish each fish bowl I punched one Modern Label from Whisper White cardstock and glued it to the top of the bowl. 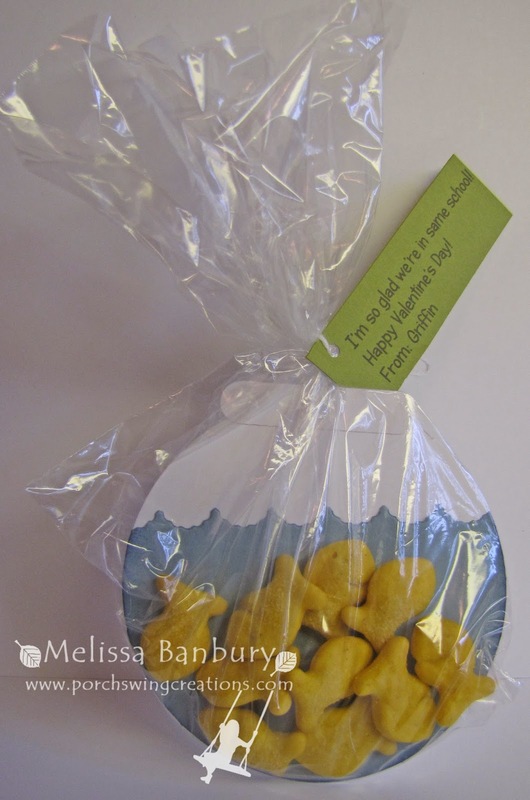 To complete each Valentine, slip the fishbowl inside a clear snack bag, add a few Goldfish crackers, a label printed in My Digital Studio, then tie the top with a length of Baker's Twine. I love your designs and this is no exception! I like how quick and easy this is and I could do several in a short time. I do have one question, Melissa: are the crackers in contact with the ink or glue? I realize it is dry, but wonder if I would need to worry about that? I didn't give it much thought since I knew both ink and glue were dry but if it's something you might be concerned with the ink could always be eliminated and Snail glue instead of Multi purpose glue could be substituted. Or, a separate snack containing just the crackers could be put inside the larger snack bag. Hope that helps!